Beautiful 3 Bed 2.5 Bath, Conveniently located, with easy access to 121, 35 & NDT. Open floorplan, perfect for entertaining. Large living room with wood floors. Gourmet kitchen with gorgeous walnut cabinets, granite counters, stainless appliances & walk-in pantry. Large master suite features private balcony. Wonderful 3 bed, 2 bath, 1640 sq. 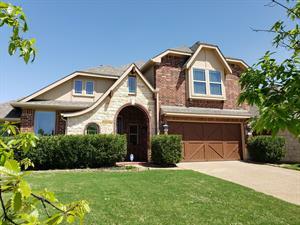 ft. 1 story home in Waxahachie, TX! Open and bright floor plan. Huge kitchen with tons of cabinets and plenty of counter space. Breakfast area with backyard views. Spacious living room. Large backyard. Be sure to schedule your showing today! LOOK NO MORE! Coming in June, this lovely home has everything you want! Georgeous hand-scraped hardwood floors meet you upon entry and continue throughout the formal dining and living area. The master is huge with plenty of natural light from the curved windows. The splendid kitchen, with a walk-in pantry, granite counter tops, stainless steel appliances, gas cook top, and more, opens to the family room and the 2nd dining area. There is plenty of room for family or guests in the many bedrooms with split floor plans, downstairs. Upstairs, continue your entertainment in the game and media rooms. Outside, enjoy the large patio area and landscaping. Savannah has many amenities including a giant water-slide, dog parks, work-out facility and basketball court. Make this your home today!